Earth to earth – For the fainthearted . . . Soil reaches deep into our psyche, into the sub-conscious. “Dust thou art and to dust thou shalt return;” soil speaks of mortality, but also of new life, of new growth. Touching the soil evokes feelings words could never adequately express, it connects one with the Earth from which one has risen. It is in the earthy moments that we come closest to the reality of ourselves, and most distant from the tenets of organised religions. Adherents of pre-Christian traditions will claim that we became detached from the soil when a regard for Mother Earth was replaced by a propositional belief in a sky god. Mother Earth was comprehensible, her soil and terrain, her flora and fauna, her times and seasons; each was apparent and recognizable. To treat the Earth with reverence and care seemed natural behaviour for those whose daily existence depended upon her provision. The advent of the religions of the sky god allowed the leaders of such religions to pick and choose their doctrines; on what basis might anyone challenge the assertions of those who say their religion is true because they say it is true? A spirituality rooted in the Earth does not cause the cognitive dissonance of the sky god religion. Thoughts regarding Mother Earth might quickly be discarded if it is found that beliefs are inconsistent with the physical, tangible reality. The sky god religions embody dissonance in their insistence on beliefs that are not consistent with the everyday reality of the believers. Environmentalists have long been hostile towards those Christian traditions that assert the right of human beings to assert dominion over the Earth, regarding religion as a cover for selfish and exploitative behaviour. Earthiness demands neither abstractions nor contradictions, it is just a recognition of what we are. 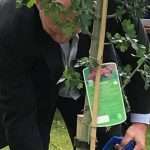 At the conclusion of the ceremony, the tub was borne by two farmers to a place where a tree had been planted. Another farmer stepped forward and spadeful by spadeful filled the hollow in the ground that surrounded the tree with the soil from the tub. 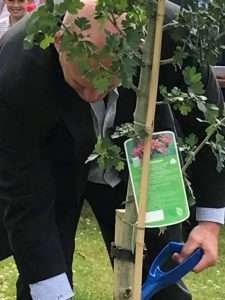 There was a profound silence among the onlookers; the mingled soil representing the lives of those remembered becoming part of the life of a tree that would stand for generations to come.